They are there - they were just further North. EDIT: I can't recall if we finished this map/project. Not sure what happened there toward the end. I must be getting old and forgetful. more maps(nippets)?! I just cried a little! thank you so much! Can't wait to see all of it! (there are four Lhuve's? :O ) .... hmm I feel like I should try to find at least -something- you would have forgotten on the map ;-P Do you have Karscragg on it? Talontower is a repurposed Lhuve. The unlabeled site (with the red line going to it) is a Dlardrageth Armory (there were five of those as well IIRC - two have proper names, but thats not one of them). And once again, here's to hoping that the High Forest sourcebook sees the light of day at some point. EDIT: And I just realized there's no way thats the final map - most of the text doesn't have the 'glow' that makes it pop. In which year is this map valid? Are the avariel there canon? I believe so. I was just placing stuff as directed with this one. You'll note I used the 'ruin' icon, though. I use a different icon now (note Mhilamniir and Karse) for 'extensive ruins'* - meaning more then just one building, like a settlement (think RW ruins). The old, solid square one is of the 'dungeon' variety. This map wasn't specifically dated like the Shining Vale (Daggerford) one was, but I think it is circa the 3e era (so 1370's). *EDIT: So having said that, I suppose Lothen should have had that 'extensive ruins' icon as well. I think I was just trying that out for the first time and hadn't finished changing the rest. Edit: Oops, it does.. just missing a few letters. I just noticed 'Korianthil Lands' on the snippet. I'm intrigued. Is it something you (or Eric) can tell us more about at this time? That would be up to Eric Boyd. Although I read through his work (which I am sure is greatly added-to and modified by now), I don't recall the specifics, nor is it my place to share them. I try to only elaborate on those things which were preexisting to The High Forest project. Oh wow that is fantastic! That's exactly what I need for my current campaign. Is that full map available anywhere? Perhaps for purchase? Awesome work. Is Askovyn Tangle supposed to be Auzkovyn Tangle? The two names seem awfully similar. The resolution is not readable for Woody Glen area of the High Forest (NW'ish). I really wish I had time to get back to all these wonderful FR maps, but alas, my plate is rather full these days. (In a good way - waiting for some announcements). I would assume so, but you would have to ask Eric Boyd that. All the names were given to me to place. I just did a search of the (brilliant) pdf and couldn't find either. I would have to ask Eric Boyd if he wouldn't mind me posting the full map at this point (and perhaps the Daggerford/Shining Vale one as well). I did them for him personally. Not sure if anything will be done with them down the road at this point. If he says I can post them, I would probably make them exclusive to The Realms Secretariat (where Eric & Krash have been posting some lore). It cannot be sold, because neither one of us owns the IP, or have any rights to it. And YES, the map is WAAAAAAAY bigger then that. 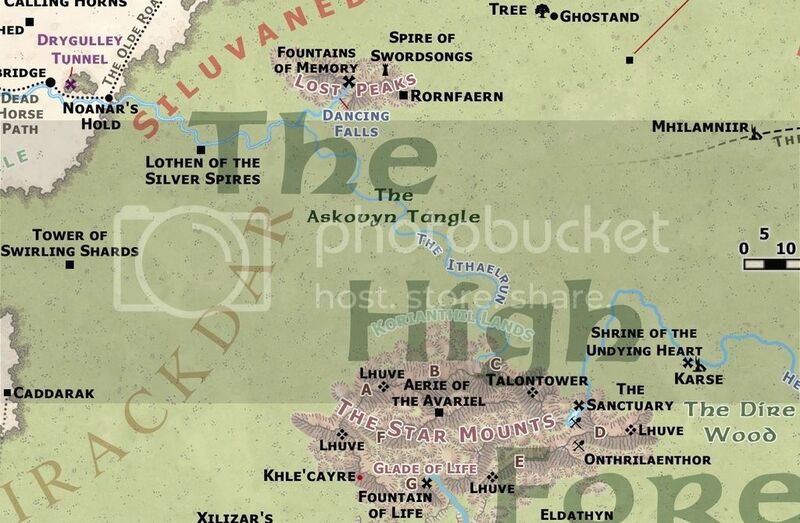 It encompasses the whole of the High Forest and surrounding regions, and connects directly with the older Shining Vale map (which I completely re-did to make sure they matched). Cool. I've been searching for exactly that type of detailed map. It's so nice to be able to refer to one map with ALL the locations on it, rather than trying to use 3 different maps, between three versions, etc. My players (especially my wife) are exploration driven and they will stare at these maps and discuss what may be here or there for hours at a time. They LOVE the maps, especially your work. All the maps, in particular yours and Mike Schlay's have been driving my entire campaign. Good maps just really make a huge difference. Please let us know if the entire map can be shared. Thank you. Hey all, sorry if I am resurrecting an old thread but I was wondering if these maps are still available some where? I'm just waiting on hearing back from Eric Boyd. A 'nudged' him a couple of weeks ago, but he was starting a new job, and I'm sure he's very busy with that. He wanted to 'go over it' one last time (I am sure he's added great swaths of info since he and I stopped working on it). Thank you! That's very exciting to hear. EDIT: BTW, Krash - Impiltur needs a river. There's no (spring) water run-off on the eastern side of the Earthfast mountains, which is unnatural. The Icehilt and Great Imphras Rivers account for the Earthspur, but not the Earthfast range. I added one to Turmish for the same reason (and since no-one 'claims' Turmish, I figured that was no big deal). I've never done a map in quite this fashion before - usually I am drawing a little bit of everything all over the place. Seeing all the waterways - rivers, lakes, and seas - without the other terrain makes a few oddities pop-out that I hadn't noticed previously. I had noticed this too. The only explanation I came up with in my head was that there were a myriad of streams and creeks running south off the Earthfasts that simply didn't rate "river" status - but I know geographically that this isn't a really feasible explanation; not that geography is my strongpoint. Note: Also found I was missing The plungepool in Cormyr. No matter how many times I check over something, there's always something else I missed. I'm happy with how the mountains are looking, BTW. I find that too. im just going over OGB in detail and there are loads of single line remarks that seem way more important now than they once did.